In a bold step, US President Donald Trump has formally designated Iran’s elite Islamic Revolutionary Guard Corps (IRGC) as a terrorist organisation. This is the first time the US has labelled another nation’s military as a terrorist organisation and shows the seriousness of the Trump administration to hold Iran to account for its terrorist activities and to defend Israel and the region from these threats. This move is said to carry serious financial implications for Tehran, allowing the US to impose further sanctions on Iran, and lengthy prison terms for those who provide material support. Iran’s leaders responded angrily with President Hassan Rouhani saying the US was the “leader of world terrorism”. Iran also retaliated by calling the US Central Command (Centcom) a terrorist organisation and the US government as a sponsor of terror. US military bases in the Middle East are on high alert following these threats. However, Iran also threatened “massive retaliation” after President Trump withdrew the US from the Iran Deal and that never materialised. Tensions between the two countries are rising though and Iran is determined to wipe the US off the face of the earth as much as it wants to destroy Israel, so these threats must be taken seriously. The Islamic Revolutionary Guard Corps is #iran's primary tool to implement it's global terrorist campaign. including through the #Hezbollah & #Hamas #terror organizations. Make no mistake about it. Iran’s Islamic Revolutionary Guard Corps (IRGC) is acting like a terrorist organisation. The IRGC runs Tehran’s ballistic missile programme and is deeply involved in Iran’s nuclear programme. 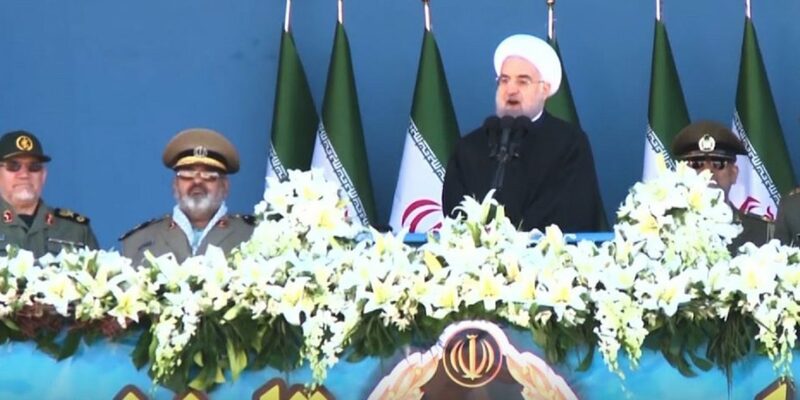 Iran, through the IRGC, exports terrorism by sending money and weapons to areas such as Gaza, to fund Hamas and Islamic Jihad, and Syria and Lebanon where it funds Hezbollah and also deploys its own troops to bolster Hezbollah’s ground forces. The IRGC is also directly involved in planning terror attacks. Iran remains the world’s largest state sponsor of terrorism and is a source of instability in the Middle East. It is right that President Trump took this bold decision and we hope more countries will wake up to Iran’s threat and take decisions like this.